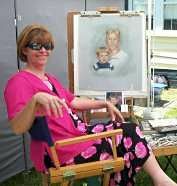 We offer portraits in oil, pastel and watercolor. What is the difference between the different mediums? All three mediums that we use are created from the finest artist grade pigment. The difference is that their binders are different. The binder used in oil paints is linseed oil. The binder for watercolor is gum Arabic and the binder for pastel is gum tragacanth. This difference in binders is what leads to the different techniques of painting. Which one lasts the longest? 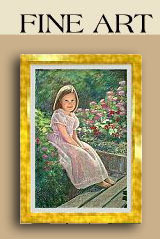 Our oils, pastels and watercolors will outlive your grandchildren! Although oils are considered the traditional portrait medium, today’s acid free papers, specialized materials and museum framing techniques make today’s portrait an heirloom for generations! Which one do you prefer doing? We love to work in all these mediums. Can you work from older photos? Yes! We will check them for clarity and advise you on which direction to go from there. Absolutely! Theresa spent years with both horses and dogs. She raised Connemara ponies and Belgian draft horses as well as competed in Hunter Jumper events. She also owned and operated a 100 run boarding kennel and bred and showed the top winning Field Spaniel in the history of the breed. Did we mention the dairy goats? The cameo pet portraits are very popular as are the portraits combining the owner and pet. Check them out! I would love a surprise portrait of our house for my husband. Can you paint portraits of houses? Of course! Steve usually creates the house portraits. The most popular medium is watercolor and three sizes are available. Although we can take the photographs, clients like to show us favored landscape photographs so we will gladly work with you for that perfect look of your home! At the same token we have painted portraits of boats, cars and assorted inanimate objects! I already have a great photo of my child but I don’t like the background. Can we change that ? Yes! We are always creating backgrounds. Currently the most popular ones are gardens and beaches. Can you put people together who were never photographed together? Yes! That is one of our most often asked questions and the resulting portraits are a delight to our clients. I don’t have any good photos of my children (myself, my mother, etc.) Can you take the photos? No problem. That is our specialty! Given the option , we normally prefer to take our own photographs of the subject. We take photographs with the knowledge that we will be using them to create a finished portrait (not a photograph) so our concept of a photography session is different than that of a photographer. We are casual and relaxed and the result is subjects who are also relaxed! If you have photographs, let us look at them. If we are taking the photographs, we arrange an appointment for a photography session either at your home or on location somewhere else. After we take the photos, we'll develop them the same day and help you select the right pose and expression for your portrait! At the same time we will help you decide on size (we’ll sketch out sizes for you at your home), which medium and your framing requirements. I don't live anywhere near you. Do you travel? Yes! We travel all over the United States meeting clients. The client provides both transportation (airfare or gas mileage) and room and board if we are traveling a great distance. If the photography session is within 100 miles of Raleigh, NC, there is no charge for travel. Do you charge anything for your photography? No! We collect $150.00 at the time of the photography session that is then applied towards the downpayment of the portrait if for some reason we have to return at a later date. Since we will be working on your portrait back in our studio, we find that our photography is necessary, not optional (if the subject is available) and usually superior to many photographers' photographs! Our photographs reflect our knowledge of face and character and represent what we are looking for in expression, pose and lighting of our clients! Although the resulting photographs are ours, the client can better visualize (especially when we sketch them out) what their final portrait will look like! We are working with our clients and creating their portraits all the time! 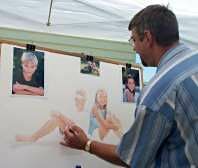 Generally we complete our portraits in 4-6 weeks from the time we begin working on them. Oils take longer because of the nature of the medium. There are times when we find it more convenient to schedule the photography session now although we may not be able to start your portrait for a few weeks or months. To avoid disappointment, please allow for our schedules and contact us now! In all of our years of portraiture, we have never had a disappointed client! Read our testimonials or personally contact some of our clients! "Getting a likeness" is our specialty!! That is why we work hard to determine the right portrait for you before we start! We always emphasize that this is YOUR portrait (not your neighbor’s or mother in law’s) and will gladly work with you to create that special portrait you will proudly display in your home! If there is something that I would like to change after I see my portrait, can that be done? Of course! If, after viewing your portrait, there are some alterations needed, we will happily make any adjustments. Simply let us know within 7 days of accepting the portrait so that any color pallettes that we used are still fresh! Can my portrait be shipped? Yes! We have shipped our portraits (all mediums) safely around the world! We will not ship framed pastels or watercolors with glass! We always insure your portrait. Can you frame my portrait? Yes! We do have access to some wonderful framers and galleries and are available for advice, but many of our clients prefer that we handle the whole process. We accept Mastercard, Visa, American Express, checks and cash.